Involves as little design as possible. Dieter Ram’s 10 Principles of Good Design have influenced the design of the Tom Sands guitar from the conception of the company. His influences are seen everywhere and he is an integral figure in the world of design. Sir Jony Ive, the designer of the apple iPod, lauds Rams for his ‘bold, pure, perfectly-proportioned, coherent and effortless’ designs. You can see the influence below. We want to explore the first three in today’s blog post how these principles can relate to the acoustic guitar. When approaching the build of a guitar, especially an acoustic, it may be easy to forget it’s value as an object in it’s own right when preoccupied with the complexities of sound and playability. Of course, these factors are integral to the design of the instrument, but caution must be taken not to prioritise one or the other. Applying these principles of design to the modern acoustic guitar provides food for thought from client to builder. 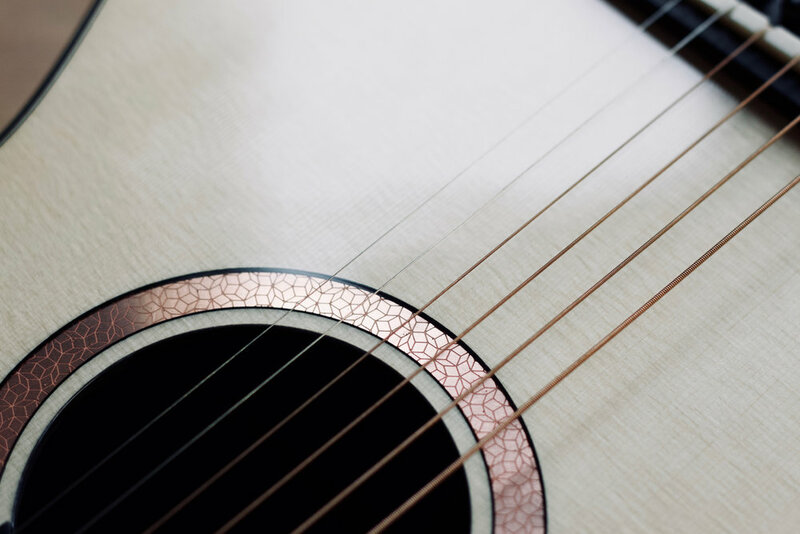 The criteria of an acoustic guitar and it’s established ‘look’, from traditional inlay materials to body shapes and headstocks, can often blind the maker into conformity as they pay homage to tradition. Indeed, those makers who seek to innovate their own designs and shapes may fall subject to traditionalist disapproval. 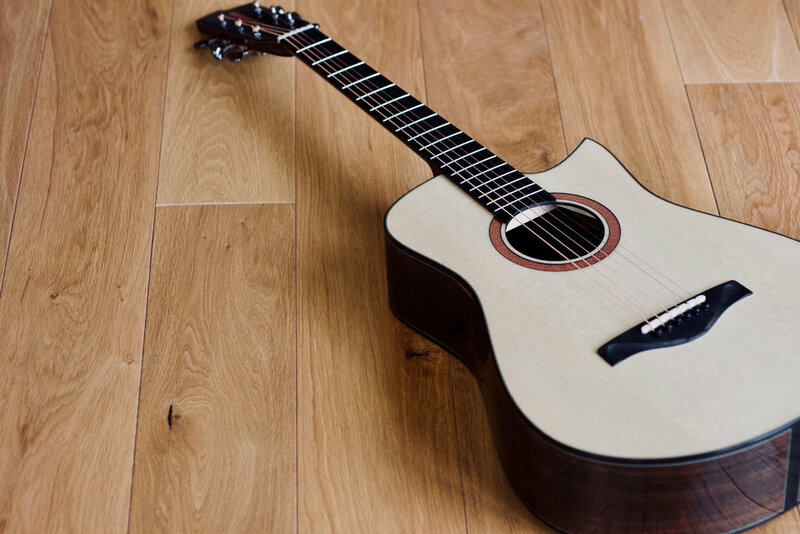 If we apply Rams’s principle to guitarmaking, however, the shadows cast by the long established acoustic guitar design could be seen as a hindrance to the progress of it’s potential. Rams suggests that ‘technological development is always offering new opportunities for innovative design’, and this is no different for the implications of the guitar. Fancy CNC machines aside, perhaps this statement can also relate to the newfound access to a broad range of internet applications, Pinterest boards and blog posts. Those who embrace the internet can only benefit from this media, whether it be coming across a weaver’s cross-stitch and picturing it within a rosette to celebrate the cross-pollination of craft, or even feeling lifted by a re-gram of a favourite Picasso, it’s at your fingertips. 2. Does it make the product useful? 3. Is your design a good aesthetic? Again, another one that seems obvious, but is often brutally overshadowed by the attraction of tradition. Yes, herringbone can be beautiful, but does it offer a story in this day and age when it’s story has been told hundreds of thousands of times? Does it fit with the ubiquitous minimalism in everything from technology to your Scandinavian style bedroom? Next post will explore 4, 5 and 6. What do you think about the first three? Have you thought about when when commissioning or when building?